In the video below, you’ll see the perfect example of who NOT to befriend in life. Brooke Mueller is lamenting about her Charlie Sheen breakup, along with her sobriety struggle. Instead of sympathizing with her pain, her extremely horrible assistant and “friend,” decides to yell at her. Let this be a lesson to those who denounce Alcoholics Anonymous and therapy in general — most of the world is comprised of jerks, so seek out a decent support system and rid yourself of toxic, heinous people. Watch below. You know when you go through a painful breakup and you spend most of your time bad-mouthing your ex to anyone who will listen? Well, Paris Hilton is not in that club. Though the press often picks on her for being famous for nothing,” I have to give her major kudos for the way she handles her breakups. I imagine that if I was wronged on any level, I’d take great enjoyment from using the late-night circuit to bash my ex. As a guilt-ridden Jew, though, I’d certainly self-loathe shortly thereafter. Hilton appeared on Lopez Tonight, and Lopez showed a disturbing fight between Hilton and her then boyfriend, Cy Waits, in which Waits’ consistent jealousy reaches a boiling point that results in Hilton slapping him in the face. Clearly, these two were not meant to be. But instead of lambasting him, Hilton was kind, saying, that “the relationship just ran its course.” Who would think I’d ever call Paris Hilton classy? Watch the fight below. 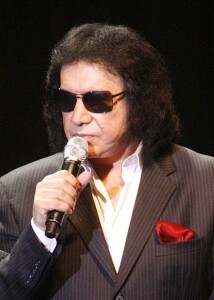 Are Gene Simmons and Shannon Tweed Splitting Up? Gene Simmons appeared on Cheslea Lately, and Chelsea represented women everywhere by asking why one woman isn’t enough. She also referred to his longtime partner, Shannon Tweed, as his “wife,” which clearly ruffled Gene’s feathers. Gene tried to evade her inquiry and Shannon then yelled out from the audience, “answer the lady!” Predictably, Gene did not have an answer. When Chelsea asked if it’s okay if Shannon sleeps with other men, he also shirked responding, which leads me to to believe that Gene Simmons is a misogynistic hypocrite. Plus, his hair is gross. It seems that Chelsea was on to something. While promoting the new season of their show on The Today Show, it appeared as if their marriage is ending. Watch both interviews below. Author The DishmasterPosted on June 13, 2011 June 13, 2011 Categories GeneralTags Celebrity Breakups, gene simmons, shannon tweed, The Today ShowLeave a comment on Are Gene Simmons and Shannon Tweed Splitting Up?